Sean Szymkowski September 12, 2018 Comment Now! 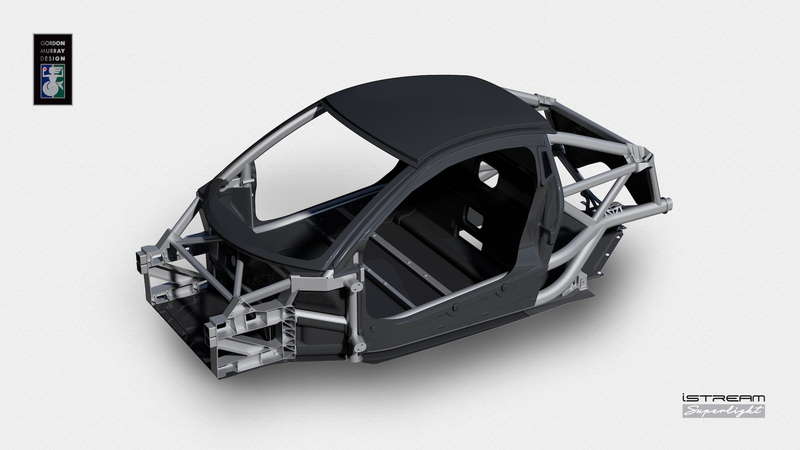 British engineering outfit Gordon Murray Design has touted its iStream construction for a few years, but the latest iStream Superlight method doubles down on the architecture's core principles: it can cut a car's weight in half. Compared to traditional stamped metal, the iStream Superlight method results in 50-percent weight savings when producing a body-in-white, but it also offers increased rigidity, durability and platform flexibility. It's also more corrosion resistant than coated steel. The key is the replacing of traditional stamped metal with a high-strength, thin-wall aluminum tubular frame in combination with recycled carbon-composite panels with a honeycomb structure. We're talking Formula 1-derived technology. But this isn't intended strictly for high-tech, high-priced cars. GMD envisions iStream Superlight and the more basic iStream as a mass-market replacement for traditional car construction. 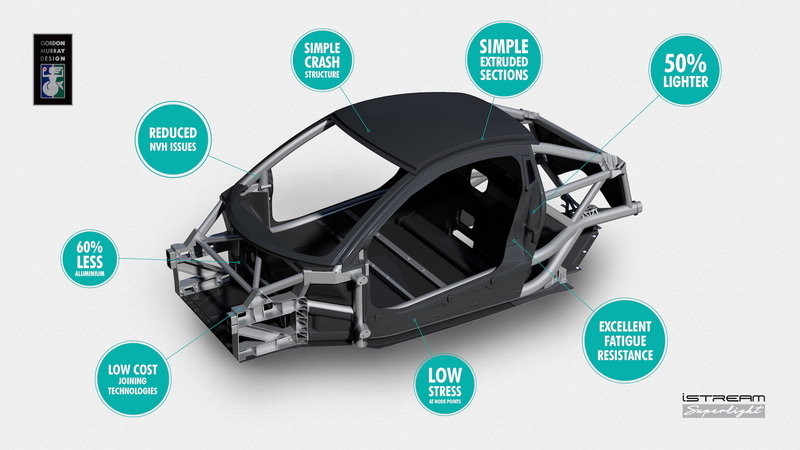 Rather than building a few separate structures for various vehicle segments, iStream's modular architecture can suit anything from sports cars to light commercial vehicles and even SUVs, meaning cost-effectiveness for manufacturers by avoiding the need for high capital investment and individual structures for each segment. Alongside the latest specifications for iStream, GMD also unveiled the iStream lightweight seat design. To further save weight, the seat uses glass or recycled carbon fiber composite and a tubular frame to weigh 30 percent less than a traditional car seat. 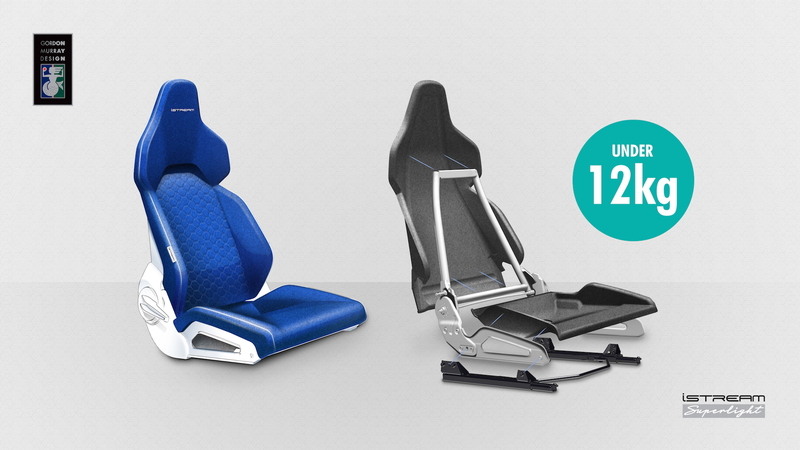 Like the iStream method itself, the seat structure is adaptable to fit all types of passenger vehicles, according to GMD. The company also said the seat can fold completely flat and is four-way adjustable. The first production car to take advantage of GMD's iStream construction is the new TVR Griffith sports car, due to enter production in 2019. The long-dormant manufacturer will take advantage of lower part counts and a quicker production process to build more cars even more quickly than many small automakers. We'll also see iStream feature on cars designed by Gordon Murry Design founder Gordon Murry, the chief designer of the McLaren F1 and numerous championship winning F1 cars. 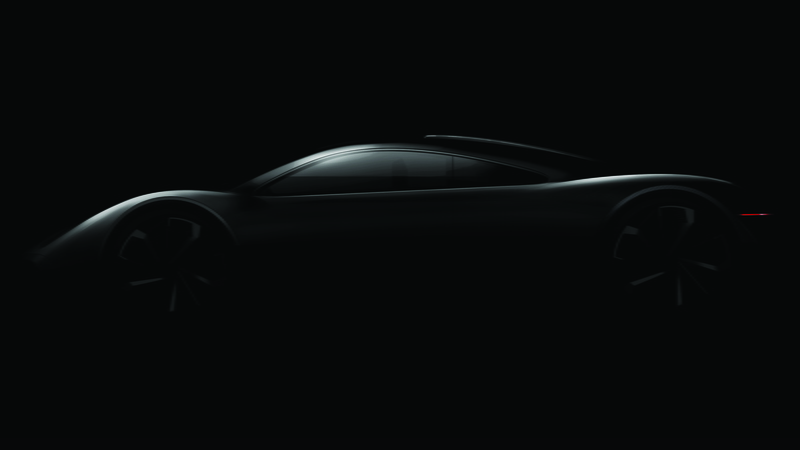 Last year, Murray launched Gordon Murray Automotive as a standalone automaker. The first model will be a sports car code-named the T.43 and utilizing iStream Superlight to tip the scales at just 1,874 pounds. In the announcement, GMA said the sports car will use a 1.5-liter turbocharged inline-3 and make 220 horsepower. A six-speed manual transmission will be the only option as GMA channels Murray's iconic McLaren F1 in the pursuit of driving pleasure, not just speed. Should all go to plan, GMA will not only build and sell the T.43. The company will also license the structure to other firms as well as manufacture cars for other firms. And Murray has already mentioned plans to develop more vehicles including sedans and trucks based on iStream.